September started to show the dramatic downward shift I’d been anticipating, which was not entirely devastating since it was expected. But, it does prove that all success is finite and that if I want to continue making money as an author than I’m going to have to do the most obvious thing, which is keep writing. Which…I’m struggling to do right now while I’m in school. The good news is that I’m getting caught up on homework and will soon have lots of time–more time than I originally anticipated (due to quitting my full-time job and whatnot)–to finish TGIB series and move on to NEW projects!! But those things are still a long ways off (I’m shooting for a March 2016 release for TGIB book 4) and there’s still a TON of work to do in the meantime. Since it’s likely that I won’t have a new book for sale for another 5ish months I’m trying to research ways to break into more international markets. My success in the UK sort of just happened, which means that I’m not exactly sure how to replicate it. But my sales in territories like Canada, Australia, and India have slowly been on the rise and even though they’re somewhat minuscule at present I know that if they pick up I’ll have a stronger financial foundation to support future projects. I just have to figure out how to make that happen. So, if anyone has any resources–blog posts, promo sites, etc.–that talk about breaking into international markets, please share them and I’ll be sure to do the same! So much for tending to my blog. Those ten days between the summer and fall semester flew by. In between I took a trip to my hometown, I bought a new car (more on that in a later post as it was an incredibly liberating moment and entirely thanks to all of YOU), and I didn’t write a single word. I take my first cert exam on September 16th and afterward will finally be able to incorporate writing back into my schedule, even if it’s only one day a week until the end of the semester (also in a later post–my anxiety surrounding my return to writing after a much-too-long hiatus). The good news is that sales still haven’t trickled out. October is officially the six-month mark and I’d anticipated a more dramatic decrease or some kind of fluctuation at least, but so far nothing catastrophically devastating has happened. In August sales slowly dropped from 200 books a day to around 170-180 but downloads remained strong, which has really been key to my steady sales from month to month. As long as people are still downloading TGIB for free I can anticipate sales for the following month, although what percentage of readers actually go on to buy book 2 I haven’t calculated yet. At the end of October I plan to analyze all of this data more thoroughly and compare Amazon’s numbers with my other retailers along with blog stats and new newsletter followers. But for now, please excuse my hibernation (I know, I know, AGAIN) while I cram for cert exams and try to psyche myself up for my return to the Dreamer Universe. 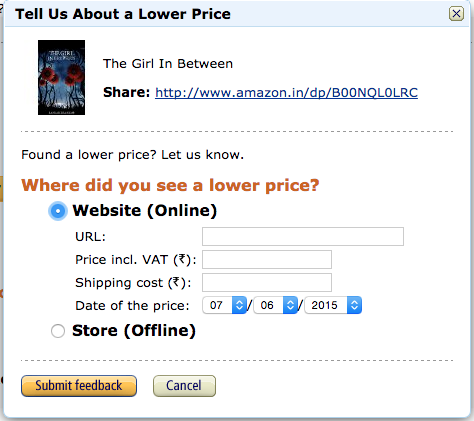 There are still a handful of international Amazon retailers that don’t have The Girl In Between listed as free. If you live in one of these territories and want to be able to download the book for free or if you just feel like doing me a huge favor, use the links and instructions below to help me get TGIB price matched!!! Choose the online/website option and then copy/paste the links above one at a time before typing $0 in the price field and hitting submit. These forms are identical in all languages so just paste the same information in the same fields each time. If you happen to take the time to submit price matching feedback on any of these Amazon sites please leave a comment on this post so I can thank you personally! The success of my books has been a team effort between readers and my fellow indie authors and I couldn’t be more grateful! Thanks in advance to everyone who lends a hand! 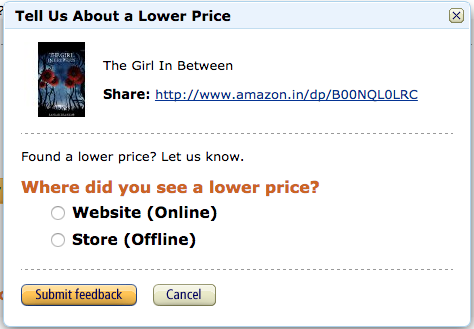 Sometime around the end of April Amazon finally price-matched The Girl In Between and made it free on Amazon UK. Since then downloads have skyrocketed and sales for the other books in the series have steadily grown. Like…a lot. Amazon even put a cute little “Best Seller” flag next to the sequel! The Girl In Between and The Boy In Her Dreams have both hit number 1 in several categories over the past week, which is the result of over 15,000 downloads and 1,000 copies sold. Looking at the rankings for The Boy In Her Dreams, I’ve concluded that you need to sell between 30-50 books a day in order to chart on one of Amazon’s bestsellers’ lists. I had a few days this week where my sales reached 100, which I have to credit for pushing the book into the number one spot on the lists below. Yes, that is THE Cassandra Clare stuck at number 4. And do you see who just so happens to be battling me for first under Teen & Young Adult Paranormal & Urban Fantasy in the screenshot below? Yes, that would be THE Veronica Roth. 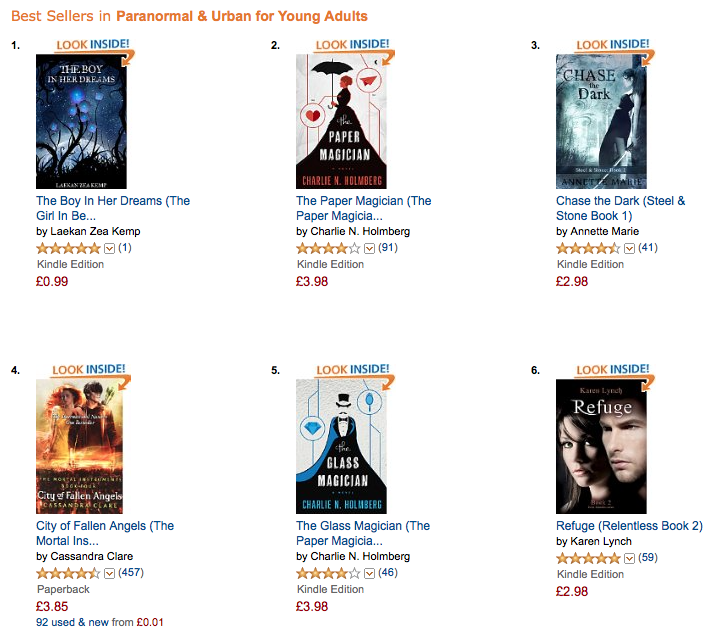 For approximately 24 hours I’ve actually been BEATING her in the Paranormal and Urban Fantasy category!!!!! As you can see May has been total insanity. In a good way. In the BEST WAY! Thank you UK readers!!! THANKYOUTHANKYOUTHANKYOU!!!! You’ve made my dreams come true. It was just last year that I was barely managing to sell a few copies a month and for the past week I’ve been selling 50+ books each night in my sleep. It’s thrilling and wonderful and magical and I can’t believe this is actually happening. Thank you to everyone who has made this possible. Thank you for taking a chance on my books, for devouring them, for loving them, for sharing them with your friends. Thank you for supporting independent art and the daring individuals who choose to make it.